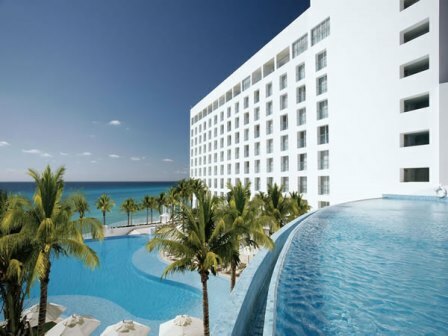 Le Blanc Spa Resort is one of the finest All Inclusive resorts in Mexico. At Le Blanc you can embrace the exhilarating freedom of doing whatever you want, whenever you want, without thought or calculation. Your butler stands ready to unpack your bags, prepare your room’s Jacuzzi, make golf reservations or schedule a tour, even iron a garment. Exceptional dining, premium wines and spirits, spa services, tours to archaeological sites, and so much more – you can have it all at our luxurious adults-only, all-inclusive resort. At Le Blanc, you’ll also find a freedom that extends beyond the expected services and beyond our doors. 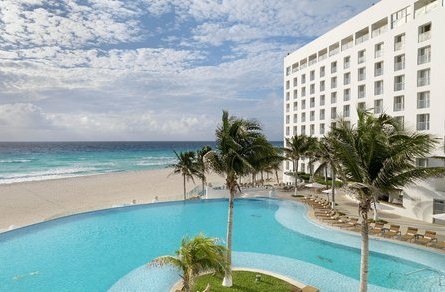 As our guest, you’re welcome to enjoy luxurious all-inclusive benefits at any of the other Palace Resorts properties in Cancun during your stay. If you want luxury and pampering, look no further. This is an award winning resort that offering both in abundance. Le Blanc Spa Resort is located at the northern end of the hotel zone in Cancun, Quintana Roo, Mexico, on the tropical Yucatan Peninsula and overlooking the Caribbean Sea and Nichupte Lagoon. 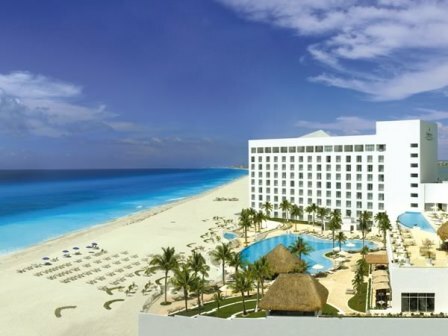 The resort towers majestically over one of Mexico’s most beautiful stretches of private beach, just 15 minutes from downtown Cancun and 25 minutes from the airport. 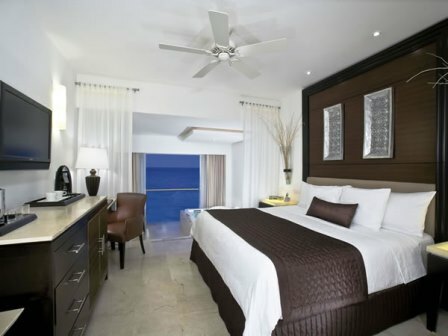 Le Blanc Spa Resort rooms each offer elegant accents of marble, rich wood, plush Le Blanc Beds and gracious furnishings. Every detail is designed to envelop you in splendid comfort. Rooms offer a double Jacuzzi, a large screen LCD TV with satellite service, a double head Swiss spa shower and BVLGARI bath amenities. Royale Deluxe – have French balconies with partial ocean or lagoon views. 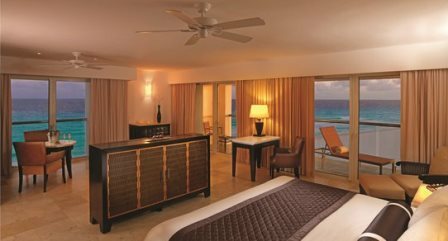 Royale Honeymoon – feature exquisite views of Cancun’s Caribbean waters. Translucent curtains divide the room, which includes a king bed and a seating area. Petit fours, red wine upon arrival, and fresh flowers in the room are just a few of the Cancun amenities you can expect at Le Blanc. Royale Governor – Translucent curtains divide the space in the Royale Governor room, which offers a king bed, private bath with double shower and double Jacuzzi and balcony with chairs & tables. Royale Jr. Suite – In room wine and fruits. Separately private bath with double shower and double Jacuzzi. French style Balcony. Liquor dispenser contains premium brands. Blanc Intl – Simple, attractive decor and a marvellous ocean view are the backdrop for an array of culinary delights from around the world. 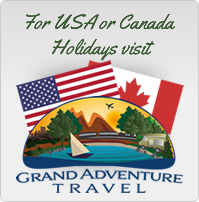 Features show cooking, breakfast and lunch buffet, a la carte dinner and wine cellar. 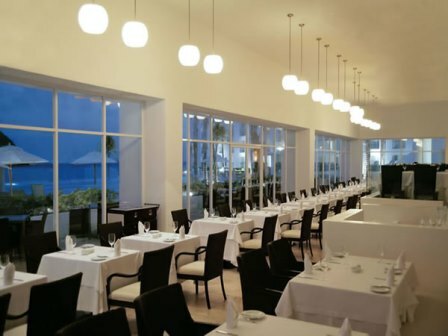 Blanc Italia – The finest in Italian cuisine, complemented by elegant design, exquisite glass decor and water screens. Savour seasonal specialities, a la carte dining and a wonderful selection of wines from our cellar. Blanc Orient – Delight in a culinary experience with Japanese, Thai and Chinese cuisine in an Asian setting serving a la carte dinner. Blanc Terrance – Located on the 3rd terrace overlooking the infinity pool and the Caribbean Sea. Guests can choose from a variety of International dishes and wood oven specialities. Blanc Stage – Delight in the night-time atmosphere at our Blancstage lounge, featuring live music, cocktails and appetisers with the ocean as your background. Lumiere – a French-fusion venue, located beside Blancintl, is an elegant and chic restaurant that will captivate guests with its unique eight-course tasting menu, which includes a series of small dishes all featuring distinct ingredients and exquisite entrees to surprise and delight your palate. Blacuna and Blancsol – Throughout the day, Blancluna at the lagoon and Blancsol by the beach and pool offer a wide range of salads, burgers, sandwiches and fresh juices.